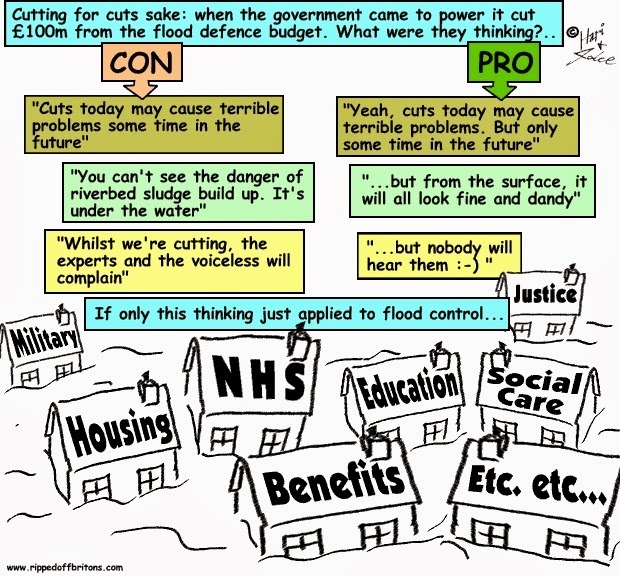 Graphs at a glance: What else will be washed away in the flood of public spending cuts? It has to be said that David Cameron had a heavy dose of bad luck with the floods in the first part of 2014. If only the flooding had waited another two years then his party's performance at the 2014 local elections and the 2015 General Election would have been better. Cameron's government took the bet that cutting spending on flood defences would not be noticed during his term in office. Rather like a man who reckons he won't get caught driving without insurance so long as he doesn't get into a crash. A gambling man would say it was a good bet. A gambling man would look at the statistics from the Met Office to see there hasn't been such a deluge in over 60 years since the 1940s. Chances were it wouldn't happen, but chancers usually get caught out in the end. Cameron, in a Louis XV of France "Après moi, le déluge" moment, gambled on the deluge coming only after he had gone. Louis XV's prediction came true after he had handed over to his son Louix XVI who lost his head in the French Revolution. For Cameron the deluge came early. "Let me answer very directly the issue about flooding. This Government have spent £2.4 billion over this four-year period, which is more than the £2.2 billion spent under the previous Government"
Figures from DEFRA giving spending plans as at January 2014 disagreed. The Parliamentary Briefing Paper quoted figures from DEFRA showing that in both Cash Terms (i.e. number of pounds) and Real Terms (i.e. adjusting for inflation) planned spending as at January 2014 was lower than during the last four years of Labour government upto 2010. Cameron's promise that "money is no object" will push the spending up, though we will have to wait for the next deluge to see if it has been enough. Gamblers are optimists. Few people gamble expecting to lose. Cameron hopes that the chances of getting drenched a second time before the 2015 election are low. Government spending cuts have no doubt identified great waste. Continuing cuts are equally without doubt degrading public services and infrastructure. Cameron hopes that he will have left the casino before the cards turn against him again. We Britons, on the other hand, can't leave the casino - what to Cameron is a casino to us is Britain. At least with the floods we see an immediate and direct link between spending cuts gamble and the watery wreck and ruin. The consequences of other cuts will take longer to become apparent, and will therefore be too entrenched to be sorted out by people wearing wellies. If this isn't THE definition of false economy then I dont know what is? I write in May 2016 after the devastating floods in Yorkshire that will cost billions more than the money saved not to mention the heartache caused. Cameron is a liar and his party are a menace to society.